CBD (cannabidiol) is soaring in popularity for good reasons. This all-natural remedy promises to deliver relief for anxiety, stress, sleep problems, chronic pain, dry and aging skin and more — all with minimal side effects compared to man-made pharmaceuticals. The demand for CBD oil has grown incredibly in the last few years and the market is meeting those needs. With so many companies now offering CBD oil, how do you find the safest and most reputable brands? We’ve done the homework for you. Don’t know much about CBD oil? Read our CBD oil guide to learn everything you need to know, from how it’s derived from the cannabis plant and its legal status to tips for finding the safest, high-quality oil. You may wonder what’s the best CBD oil for pain, or what’s the best CBD oil for anxiety. CBD oils aren’t formulated for specific conditions. That’s why we’ve numerically ranked our best CBD oil companies based on quality, reputation and transparency. Not in-tune with CBD terms? They can get confusing. Refer to our CBD terminology section below to understand the terms we use in our reviews. Green Roads World is one of the most reputable manufacturers of CBD oil in the U.S. It was founded in 2011 by a 20-year licensed pharmacist. This company arguably makes the purest form of CBD oil on the market. 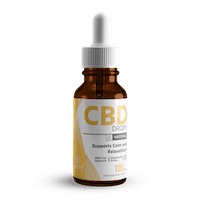 It extracts its CBD from 100% industrial hemp, which has non-detectable THC, and then remove all traceable amounts of THC to give you entirely pure, natural CBD. Green Roads’ unique full-spectrum CBD oil includes crystalline isolate CBD and a vegetable glycerin and hemp seed oil base. This formulation gives you other beneficial terpenes and cannabinoids in your oil in addition to pure CBD. Green Roads World offers a wide variety of CBD products, discounted bundles and discounts for military and first responders. Recommended use: place 0.5ml -1ML under your tongue for at least 30 seconds before swallowing. 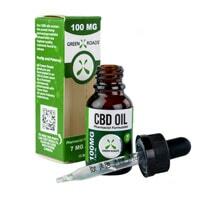 The mg refers to the concentration of CBD in each product. CBDPure has an excellent reputation for specializing in high-quality CBD oil. It concentrates on smaller-batch productions and tests every batch three times, once at harvest, again at its production facility and finally by an independent third-party laboratory. It also posts its test results publicly for every batch going back 24 months. CBDPure only offers oils and soft gels, but if you’re not looking for other products, it provides one of the best values for the level of quality you get. It even backs up its promise with a 90-day money back guarantee. 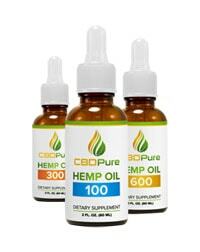 CBDPure offers discounts when you purchase multiple bottles. Recommended use for oils: 1ml twice per day. Hemp Bombs, a Florida-based company, offers premium-grade CBD oils and many other products. This company used to source its organic, industrial hemp from Europe but have recently moved its farms to America. Unlike a lot of brands, all of Hemp Bombs’ products use 99% pure CBD isolate, rather than a full-spectrum extract. 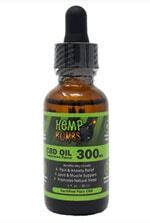 It doesn’t offer low potency oils like many other brands, however, with 300mg being the lowest available. Huge variety of products, including oils, gummies, capsules, vapes, topicals, etc. Hemp Bombs offers oils, capsules, syrups, gummy chews, vape oils, topicals, beard oil and more. Florida-based Diamond CBD includes a team of doctors and scientists committed to researching and developing innovative CBD hemp extracts. The massive diversity of CBD products it carries speaks to this innovation. This company certainly beats its competition for the sheer range of products it sells. Not only does Diamond CBD carry hundreds of different oils, but it also offers many types of edibles, as well as creams, vapes, capsules and even dabs. One item of note: although Diamond CBD posts all of its third-party lab testing reports online, it’s fuzzy and difficult to read. We found this a questionable lack of attention to detail. Still, this company gets generally good reviews from users. 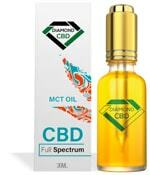 Diamond CBD offers free shipping with orders over $100. Below is pricing for some of its best-selling oils. Oils range from 25mg – 1,500mg concentrations. All of the following prices are for a 30ml bottle. 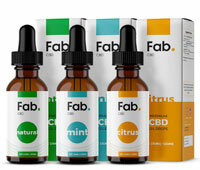 Fab stands out for its high-quality CBD oils, chews and cream and for the company’s transparency about its products. A newer company with headquarters in Tampa, FL and the U.K., Fab is a small team that’s spent more than 25 years in the pharmaceutical, health, fitness and supplement marketplace. The owners have a passion for helping their customers discover preventative health and healing through proper nutrition and natural supplements. One of the reasons they launched their products was to help their mother and grandmother reduce their pharmaceutical use. Fab offers free shipping on orders over $89 and a 30-day money back guarantee. It also provides discounted bundles. Recommended use for oils: 1/2 dropper once or twice per day. 60 servings per container. Oregon-based Hempure formulates full-spectrum CBD that includes cannabigerol (CBG), cannabinol (CBN), cannabichromene (CBC) and over 40 naturally preserved terpenes with no traces of THC. Its range of products includes CBD oils, gummies, softgels, balm, vape oil and CBD products for pets. Hempure is a team of dedicated endocannabinoid experts that’s on top of the latest research and findings about CBD. Its informative website reflects this expertise and the team’s commitment to sharing current knowledge about CBD and its benefits. Check out their guest post to learn more about the endacannabinoid system and CBD. Hempure ships to all 50 states and says shipping to Australia is coming soon. Hempure offers free shipping on orders over $99. Recommended use for oils: 1ml twice per day. Certificate of Analysis (COA): A COA is a detailed certificate from a third-party lab that guarantees the accuracy of its testing results. In the case of CBD testing, the COA shows the levels of THC, CBD, pesticides, solvents and other elements found in each product. CO2 Extraction: Supercritical CO2 extraction is a process that cools CO2 to a low temperature under high pressure, which gives it properties of a liquid and gas. This process gives scientists a better way to extract only useful cannabinoids, leaving unwanted compounds like THC behind. CO2 extraction is widely considered the best method to obtain pure, solvent-free CBD. Terpenes: Terpenes give plants their specific scents. For example, the smell of flowers, fruits and cannabis are all produced by terpenes. The terpenes in cannabis not only create a particular aroma, but they contribute to the difference between strains of marijuana. How Can I Benefit From Daily CBD Oil Use? CBD oil has very low side effects, and there are many benefits you can enjoy from daily usage. Check out this video for some of its uses. If you want to learn more about CBD, be sure to check out our All About CBD Oil article, which includes information on its legal status, extraction process, uses and benefits, a buyer’s guide and more. What benefits are you looking to get from CBD oils?